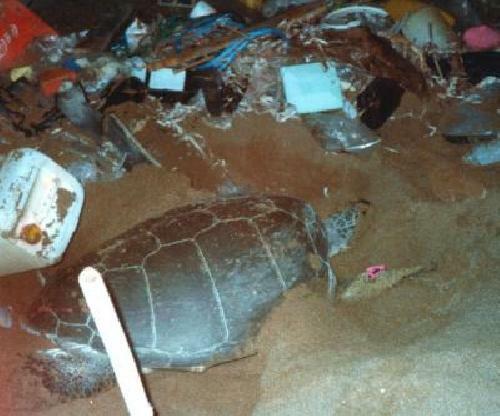 Joint lead author Sarah Nelms, from the Centre for Ecology and Conservation at the University of Exeter's Penryn campus said: "I was shocked at how little is known about the impacts of plastic on marine turtles." "We know that discarded plastic poses a serious threat to wildlife, but this study shows that more research is urgently needed if we are to understand the scale of the problem." Prof Brendan Godley, who led the team said: "When turtles ingest plastic, they can suffer intestinal blockage that can result in malnutrition which can in turn lead to poor health, reduced growth rates, lower reproductive output and even death." "It is sobering to think that almost every piece of plastic that ever entered the sea is still there; breaking down and forming a vast soup of microplastics that could have frightening long-term repercussions."